Test all patients for evidence of current or prior hepatitis B virus (HBV) infection before initiating treatment with HARVONI. HBV reactivation has been reported in HCV/HBV coinfected patients who were undergoing or had completed treatment with HCV direct acting antivirals (DAAs) and were not receiving HBV antiviral therapy. Some cases have resulted in fulminant hepatitis, hepatic failure, and death. Cases have been reported in patients who are HBsAg positive, in patients with serologic evidence of resolved HBV, and also in patients receiving certain immunosuppressant or chemotherapeutic agents; the risk of HBV reactivation associated with treatment with HCV DAAs may be increased in patients taking these other agents. Monitor HCV/HBV coinfected patients for hepatitis flare or HBV reactivation during HCV treatment and post-treatment follow-up. Initiate appropriate patient management for HBV infection as clinically indicated. Amiodarone is not recommended for use with HARVONI due to the risk of symptomatic bradycardia, particularly in patients also taking beta blockers or with underlying cardiac comorbidities and/or with advanced liver disease. In patients without alternative, viable treatment options, cardiac monitoring is recommended. Patients should seek immediate medical eva luation if they develop signs or symptoms of bradycardia. 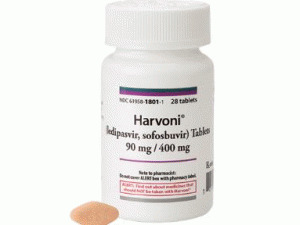 Rifampin and St. Johnâ€™s wort are not recommended for use with HARVONI as they may significantly decrease ledipasvir and sofosbuvir plasma concentrations. Most common adverse reactions (≥10%, all grades) were fatigue, headache, and asthenia. Coadministration of HARVONI is not recommended with simeprevir due to increased concentrations of ledipasvir and simeprevir. Coadministration is also not recommended with rosuvastatin or co-formulated elvitegravir/cobicistat/emtricitabine/​tenofovir disoproxil fumarate due to increased concentrations of rosuvastatin and tenofovir, respectively. 上一篇：Harvoni Filmtabletten 90mg/400m.. 下一篇：Vemlidy Tablets 25mg(替诺福韦艾..